The American flag; apple pie; mom and Uncle Sam are all iconic symbols, representative of the United States of America. The colors red, white and blue are symbolic, too. Red stands for courage, white for liberty and blue symbolizes loyalty. A national symbol expresses our feelings as proud citizens. Since many of America’s citizens have died in wars fighting for their country, the flag arouses an emotion called “patriotism." Other American symbols include the bald eagle, the Great Seal and the Liberty Bell. Songs, poems and stamps can also be patriotic symbols. On the other hand, if a group or person wants to protest something about their government, they often use the symbol in denigration—such as burning the American flag or hanging it upside down. The Supreme Court had to rule on whether this was a criminal offense and in the court case, Texas vs. Johnson (1990), they reversed the conviction of a man who burned an American flag to demonstrate his anger at the government and their policies. The Court ruled that his act was considered “speech" and that he was entitled to voice his opinion. Most symbols have stories behind them. Have you ever wondered about the word “macaroni" in the song Yankee Doodle? In 1750’s London, a macaroni was a fashionable fellow who dressed in an over-the-top manner, exceeding the ordinary bounds of fashion who seemed confused about his gender, imitating both man and woman. Because of this, macaroni also became associated with a popular hairstyle. There is a famous cartoon of a snake cut into eight pieces. Each part has the abbreviation of a state on it, such as N.E. for New England and N.Y. for New York. The heading for the cartoon is “Join or Die." This was a symbol created by Benjamin Franklin to inspire states to join in fighting the French and the Natives. On July 4, we often see the appearance of a tall, slim man with white hair and sporting a pointy, white goatee beard, wearing a blue jacket, red and white striped pants, a red bow tie and an extra-large, red and white striped hat held together at the base with a blue and white starred band. This famous icon of Uncle Sam is based on a real man named Samuel Wilson from Troy, New York. Troy is now known as the home of Uncle Sam. The 87th United States Congress adopted the following resolution on September 15, 1961: “Resolved by the Senate and the House of Representatives that the Congress salutes Uncle Sam Wilson of Troy, New York, as the progenitor of America’s National symbol of Uncle Sam." The real Samuel Wilson was a meat packer running the E. & S. Wilson Company with his brother, Ebenezer who wanted to help serve his country and contribute to the war struggle. He sent meat from his butcher shop to soldiers during the War of 1812, resulting in a contract to provide meat for the war effort. The meat was packaged into barrels that were stamped, “U.S." meaning, United States. Seeing the stamp on the barrels, soldiers were prompted to say that the U.S. seal stood for Uncle Sam, and that the meat itself, came from Uncle Sam. A newspaper picked up on the story and soon, the name “Uncle Sam" became a nickname for the United States and its war effort. Some artists want to interpret patriotic symbols because it will appeal to the masses and their work will receive wide distribution. A newspaper wrote about Uncle Sam as early as September 7, 1813. In 1860, a political cartoonist, Thomas Nast, created the original image of Uncle Sam with his white beard. When the first pictures came out with Uncle Sam as the subject, they looked like Samuel Wilson. 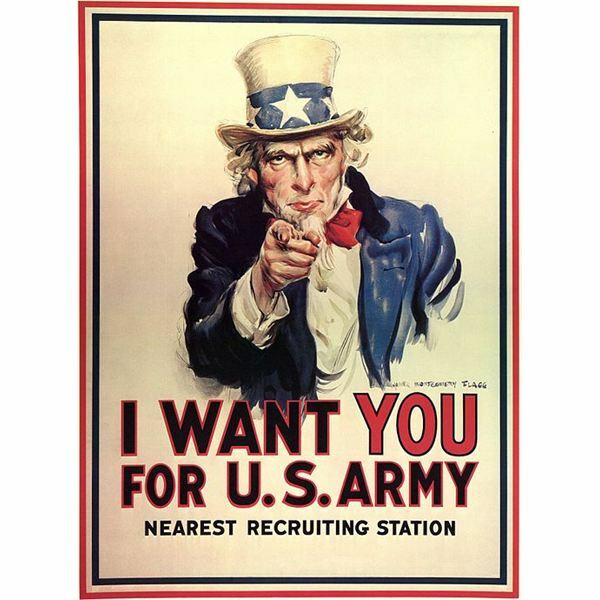 James Montgomery Flagg drew the most famous poster of Uncle Sam. The poster was a recruiting poster, meant to encourage more people to enlist in service with the army. In the original photo, Uncle Sam points his finger and the caption reads, “I want you for the U.S. Army." More than four million posters were printed prior to and during World War I. The image was actually based on an autobiographical photo of James Flagg. Newspaper cartoons, parades and posters have now become a frequent stomping ground for Uncle Sam, a national symbol associated with the United States of America and the most famous icon of all. Because of its tremendous popularity, the image was used during World War II for military recruitment. The Uncle Sam logo has remained largely unchanged since the 1960s. West, Delno C. and Jean M. Uncle Sam and Old Glory: Symbols of America. New York: Atheneum Books for Young Readers, 2000. Book. Carr, Aaron Editor. Uncle Sam. New York: AV2 by Weigl, 2013. Book.